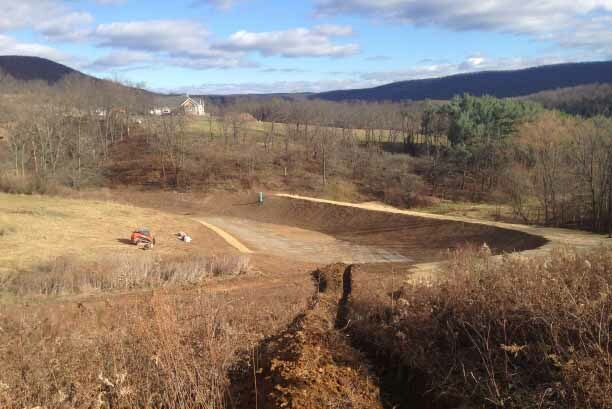 The owner of this retired farm in Centre County, PA is in the midst of a multi-phase project that began with the design of this 0.75 acre pond to be the focal point of views from a new home. Natural Waterscapes undertook the design work with a focus on aesthetics and long-term function. This area of Pennsylvania is well-known for its limestone sculpted terrain. With soluble limestone underlaying the pond construction site it was critical to create an impermeable bottom to prevent sinkholes. 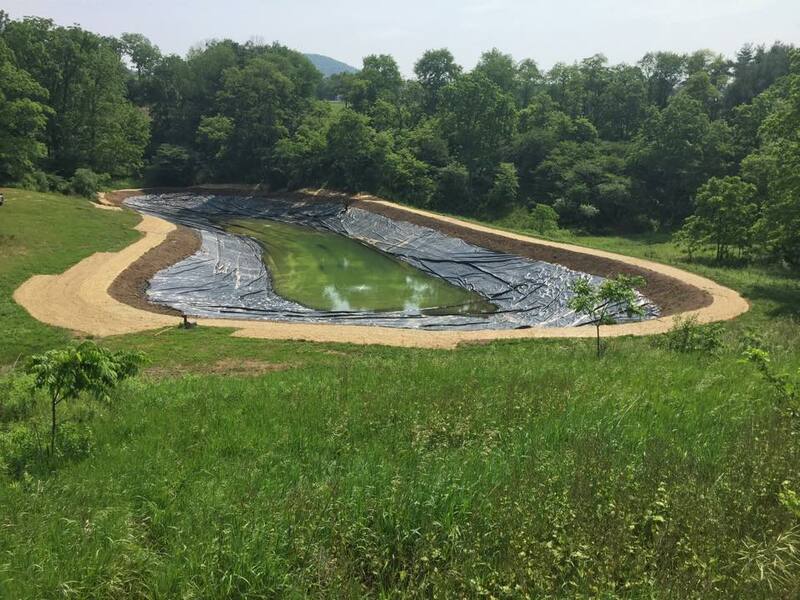 After completing the necessary earthwork to create the form of the pond, Natural Waterscapes installed an Reinforced Polyethylene Liner System with a natural edge. An aeration system and natural wetland shelf provide the basis for excellent aquatic habitat. 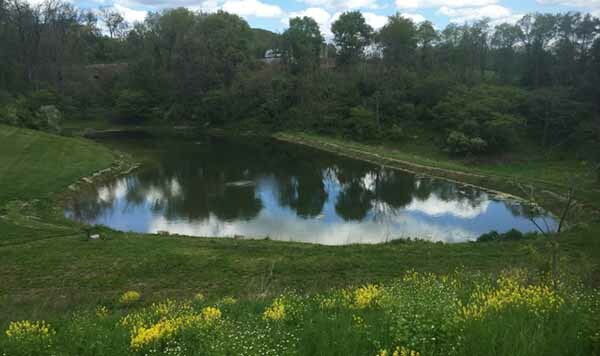 Less than one year after liner installation - Native aquatic vegetation planted on the Natural Edge begins to establish creating pond edge soil stability and excellent habitat. Working closely with the site terrain allows construction of pond that that has a natural feel and function. Properly installed anti-seep collars prevent pond leakage along the exterior walls of the outlet pipe. 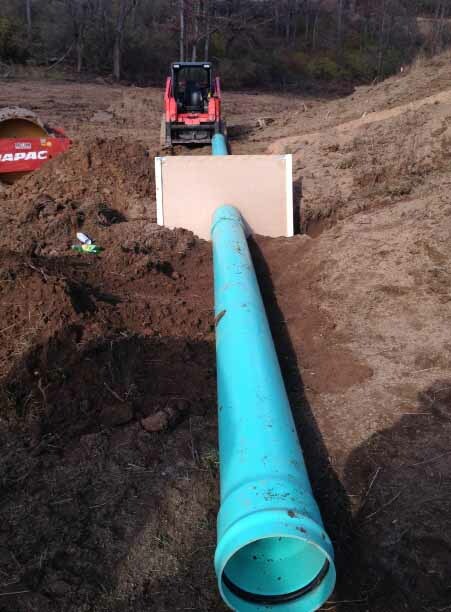 Proper preparation of the pond bottom is critical even when a liner system will be installed. Natural Edge liner installation technique creates the appearance of a natural soil bottom pond.